Being an independent is always going to be difficult, as you don't have the party machine behind you. Also, getting into the media is difficult, even if, as you do, you have something important and sensible to say, is difficult if you don't have the 'cheer leaders' behind you. Even letters to the editor seem to favour certain people; we have one who is often in our local paper who actually lifts things direct from other papers. My opinion of his actual intelligence is not high, but he seems for some reason to get in virtually every day sometimes. Anyway, good luck. We are rooting for you, even if it isn't a lot of use in actual votes. We ran one of the charcoal ring kilns yesterday. Husband went up early to light it and came back for breakfast. I went up after I had done the shopping and we filled the second kiln. I had to stop at one point because me blood sugar got so low that I was having a hypo. A biscuit and a sit down sorted that out I am glad to say, so we have the second kiln ready to fire today. Not expecting great yields, but hoping for a moderate amount and at least both hearths will be dried out and should do better next time. We shut the first kiln down about 9.30pm yesterday, having had dinner at home. We will almost certainly have a lot of brown ends, but hopefully a lot of charcoal too. Today will be a mixture of firewood load, log sacks and charcoal firing. The joys of spring! The important feature of your campaign, Cassandra, is that you are on a learning curve, and as you go through the process you are learning what to do. This may not work for you in this election, but and it is a big but, you are getting experience that will be useful to you at the next election. You will have the knowledge of what to do and what not to do. Having made contact with some voters who are on team Cassandra, then you could recruit them to help next time round for example, with leaflet distribution for their area, some may even canvass for you. Anyway I hope at 'D' day all will be ok. I hope the media will be sorry they ignored you, I wonder if that has anything to do with owners of the papers, tv and radio stations being on a more right side of the political spectrum?. However independent they should be from politics and report fairly, it doesn't happen. I read the Daily Mail only for the 4 Sudoku puzzles, Its politics are too far right for me and I am right rather than left. Best Of Luck! We have your rain today MR, started this afternoon as I came to the library. I am chopping like mad to be sure to have enough for the time I am off in the Cotswolds , but I am hardly keeping up with the current daily demand, let alone extra stock for when I am away. It is only 12 nets I need but to get that extra is a lot. For all the weather is much warmer 'they' are still lighting fires. I survive without any heat in the house, with only 2 hot water bottles in my bed at night, 1 for feet and 1 for hands. I don't know what happened this morning but I was late getting up. I am normally around-out of bed-at 4.30 and at work before 5.30, but today it was 5.15 before I woke-panic struck-and set off to do the normal things in half the time; just after 6 when I landed so not too bad, managed to open up as the first fitter arrived to start work and he didn't suspect! Technically I don't start till 7am, but I like to fire up slowly, with coffee and if there is a lot to do from the night's deliveries I can at least make a start and not have to stay too long after 1pm. I will have to look for an alarm clock; the old one of 1973 vintage has given up so I bought one from a well known super market, which has turned out to be a waste of space and doesn't alarm even the mice so doesn't wake me either if, as today, I over sleep. I think you are right about Cassandras campaign Gregotyn. Good luck with it anyway Cassandra. If you get in they won't know what has hit them! The weather was just murky yesterday with very little sun, but at least dry. We fired the second charcoal kiln and I filled 10 more log sacks while husband and son did a log delivery. We still have orders for log sacks Gregotyn, so not surprised people want kindling too. Strangely though, people are also wanting charcoal, so we are twice as busy sorting out both. At least yesterdays firing was a bit more civilised. The wood was a bit dryer, and husband had a longer free burn at the beginning, so we were able to shut the kiln down about 7.30 pm rather than 9.30 the previous evening. Managed to get a bath, so don't smell of smoke now anyway. I went for a walk round part of the wood yesterday, and found quite a lot in flower, although even the wood anemones still have plenty to come I think. I had a puncture in one of my tyres last Friday, discovered as my mechanic friend was doing the brakes. And he told me to get it sorted as it could blow anytime and cause grief. Today I remembered and went to get it done. Now how does a puncture transfer from one side of the motor to the other.....its an age thing! Today has been ok, but just got a bit overcast, expect rain on the way. I have been shopping and collected 2 number plates for a friend to save him a 30 mile round trip, only to find they are the wrong ones-he asked for motor cycle plates and got car size! Luckily that was not my fault, but they were both supposed to be long and they did one of each. How dispepsic can you be? (My family word for a hearing error). I have been looking for some suitable pallets for kindling. I have lots at work but they are currently loaded with goods. I am trying to sort a way of relieving those pallets I want. Now I have nothing to chop this weekend and am going away in 3 weeks time for a week-a degree of panic is setting in. Good news for you that two of your main products are in demand, MR., pressure all the way now! I suppose one of the reasons I asked to find out if you can get charcoal in the winter to stock for eventualities like now-on the cusp of both "harvests". All car faults wander around Gregotyn, especially if they are 'right' hand of 'left' hand as it depends on which way you are looking. It is also a bad habit of things to stay on the pallets you want; no doubt the pallets you don't want become empty immediately. Yes, at this time it would be good if we had a store of charcoal, but apart from the room for storage, we are too busy with log loads etc. Still, the first kiln provided a moderate yield in the end. There were lots of 'brown ends' which is incompletely fired charcoal, but over 30 bags of usable charcoal. The brown ends can be refired and will produce charcoal, so we may give them a go in the little retort kiln some time soon. The other kiln should be better with any luck, but we can't open that until at least Sunday, so probably next week, as we want a day off. Husband and son dug the kiln out and filled 20 bags, so son took 10 to one outlet and husband and I delivered 15 log sacks and 10 bags to another outlet in the opposite direction, so both should be happy now. Am sure the one son delivered to is going to want more next week and probably more log sacks, so I know what next weeks work is! My bad habit of stacking things on the pallets I want, began because if I reveal that pallet to the general workforce, it grows legs and goes walkabout; and the one thing I want is good quality clean pallets for the fire wood. Normally the products will go from the pallet I want and I am there, but recently things have hung around my warehouse for too long, something to do with hitting buying targets. Now I may have several pallets of 'x' because it is on offer and then the new stock arrives and it comes with a pallet I want but have to move the old stock first! Transferring 40, 20 litre drums is not my idea of fun to get the pallet I want. I am keeping going by cutting into my reserve stock at home but it is meant for crisis and it is not a habit I like, but it is making me cut wood for sticks that has been hanging around in sheds at home "in case". My reserve stock is now work in progress. I am taking a week off to go down to meet my Aussie friends in Chipping Campden, but must have supply in the shop for that week, so all go and no timber ready to saw in a bulk lot so that I can be sure to have wood for the shop when I go away on holiday. By the end of April the demand for kindling will fall off if the weather gets warmer. The problem is that there are more visitors coming back up to the 'cottage' and they have to dry things out for a few days in a property that has been closed for 5 months. My tyre thing reminds me of my mother's ode-"Here lies the body of Emily White who put out the left hand and turned to the right". I was so sure it was in the right rear tyre not the left!! Glad you have got the kiln emptied and product sold. It will be all go from here on in theory. I did have lunch outside a week ago, a rapid meal, omelette, as I didn't want the food to go cold. I am wondering how Cassandra's election is going on; no news could be good news, but I won't hear till Tuesday now. Must go for an important appointment with some firewood! Hope you manage to get your pallets all right Gregotyn. I must say that raw material for log sacks is a problem for us at the moment as we didn't expect the demand to go on so long. Like you, we are hoping the demand slows down very soon so we can get on with charcoal and other work. We had our Coppice Group AGM yesterday, and for once the weather was lovely. Misty and cold when we left home, but later on it was so warm I was working in short sleeved polo shirt and lightweight trousers. The AGM was at a farm where they have a lot of coppice woodland that one of our members is working and another worked in the past. The farm does farm tours so they had lambs and kids in the buildings for people, and us, to see. Lambs in the fields as well. Sadly they had a positive cattle TB test, so all the cattle were in barns around the place and couldn't get out as they are in quarantine I was told. Several of the fields had standing water in parts of them, and while they use at least one of them for silage only, it seemed very wet for the cows; good for the grass though. We saw some good quality coppice, and had a chance to catch up with some people I don't see very often. Later on I went out and managed to dig most of one raised bed in the garden. We have very light soil, so not too bad, and lovely quality soil in that bed. The primroses and fritillaries are in flower in the garden, so it is looking rather nice at the moment. The apple trees are just coming to leaf break, and the quince leaves are breaking a little further. It's hard to type with a kitten on your hand Gregotyn - the campaign is going far afield and most I speak to promise their vote, so if even half of them actually follow through I should get enough to avoid complete humiliation. There are obstacles to success sadly which include the comprehensive failure of the media to report on the candidates they don't already have a nice fat file on (a case of once you are in politics, your chances of election are greatly enhanced because the media don't have to talk to you), and the other being that the candidate that is running for the governing party has just arranged to have the government provide massive funding to a sports ground in the town with the largest population (ie, bought the town for her). This explains my cryptic remark MR. Another candidate has been leaving fridge magnets and on another community page someone said that they got home and found his magnet, so he has their vote! All hail to the democratic process! But that said, I have been having a great time going to places I have not been to in years, and meeting lovely people - very few that I have spoken to have been surly or difficult, and some have been downright hospitable. Fighting off offers of coffee or tea is essential as public toilets are hard to find and not always salubrious. 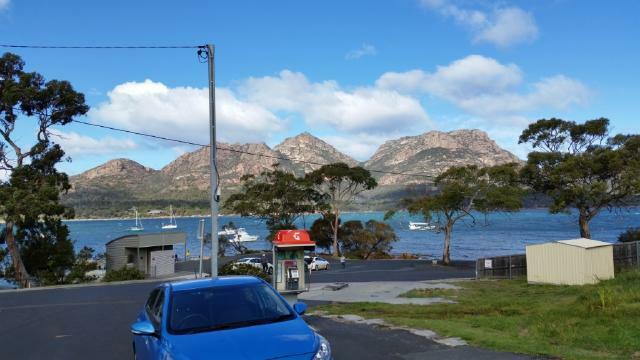 This range of mountains is called the Hazards so MR, my comment on the photo on FB was a Tasmanian 'in' joke. It was taken today. The weather here this weekend has been galeforce, bitterly cold and with rain - on the coast, as you can see, it has been breezy, but I was in shirtsleeves for most of the day. Microclimates are funny things - it's not all that far from here. 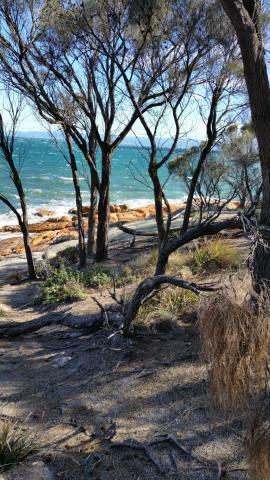 Here's another beach along the side of the road - it's a hard life here in Tassie! The animals are glad to see me home, though poor Seb has to endure another night in kennels before he is collected. So neither he nor I will sleep warm tonight (it is ten degrees in the house, despite the best efforts of the wood heater as I have been away). 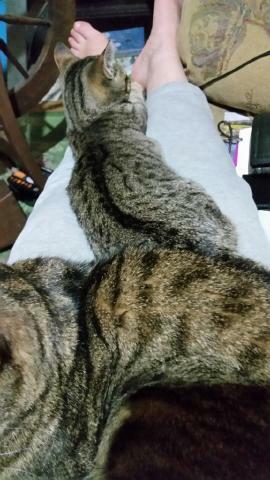 Poppet is getting bigger and bigger and she and Billy together make for a full lap. Looks beautiful Cassandra..one day we hope to stay with our friends near Georgetown and see you as well. The fact you have been round to see some people and they now know that you care about them rather than have one of their minions just drop a leaflet or fridge magnet through their door will count with some people. Unfortunately from what you say it doesn't seem likely you will win, although I hope you do, but you have been winning friends and hopefully influencing people, so will get their vote. That is one problem with going independent. I tend to look carefully at the independents first, and for local government would tend to go for them. For central government I try to vote for who I think might oust our sitting one who's party have held this seat forever, certainly all of my life and a long way before. It decided to rain yesterday, although son and DIL were able to get round the Titanic guided walk without getting wet. DIL had a great uncle who was a second class lift operator and was lost with the ship, so she always commemorates the sinking in some way. We went to a nursery we supply with log sacks and used their rather good cafe for lunch, but gardening had to be put on hold again because of the weather. Heavy rain. Just over 2 inches since yesterday evening and not done yet. 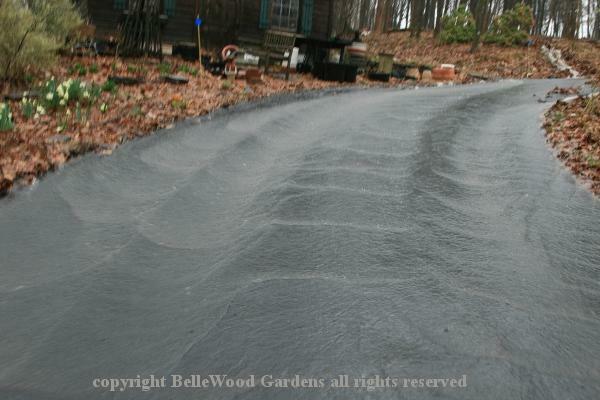 Sluicing over driveway, running down hillside carrying small branches and chunks of wood. Oh well, at least it is not snow. As you say Jam Lady; not snow. But you could probably do without that much. It has turned quite spring like here and we are threatened with rather warm weather later in the week. Still making log sacks, but also bagging charcoal. Yesterday we bagged 18 bags of charcoal and I made 12 sacks of logs while husband and son cut another firewood load. Today we have to empty the second kiln and will bag up some more charcoal. We have a home for at least 10 bags, but will check with our other outlets so we don't have anyone panicking down the phone wanting charcoal yesterday. The only reason we didn't have snow yesterday was because it would have blown away immediately! Talk about windy - gusts to 170kph! I was planning to do some printing and catching up with blogs and posts and the FB page and so forth but the wind blew over the odd power pole and we were plunged into darkness at around one in the afternoon. The situation had not improved by six that evening, so I took myself off to bed - waking around nine to discover we had electricity once more, but too late to bother doing anything about it. So I took myself off to bed once more. Called into the bank to explain my delinquency to them, and came home to print some more. I had a phone call from another mayor who has agreed to meet me at ten tomorrow morning which is a surprise, but I will turn up for all that. He is a physically repellent being with a nasty reputation - grossly overweight, and I mean grotesquely so, and sly. He is a mate of the Duke of Avram (who, in case you were wondering is a self-made duke who created a micro-country on the West Coast some years ago as a tax dodge) and has brokered a deal with the main political competition. Meanwhile I am being approached by various lobby groups to sign pledges as to how I would vote on particular issues (Finally someone who understands the sort of things one can commit to), most recently voluntary assisted dying (which I have no issue with). So that's all good. The dog was pleased to see me on my return, so bedtime last night involved having to prise him off my side. Here are two images from yesterday. 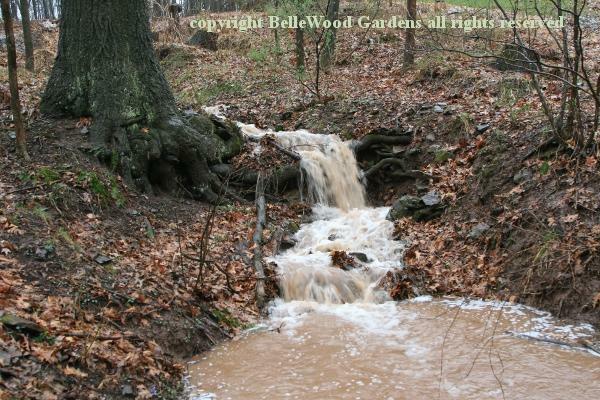 Normally dry ditch flowing like miniature Niagara Falls, so rapidly that it has made a pool before the lower culvert. Today - I need to call the Essex County Parks Dept to learn how the cherry trees are flowering. It's a late season this year and I'm not going to drive for over an hour to discover that only a few of their 4,000 trees are blooming. If good, then call my friend to come here from Pennsylvania and we'll go off for the day. If not, well, then not.